A day after returning from Hyderabad, I was busy looking at options to head back home. The last time, I took Kallada. 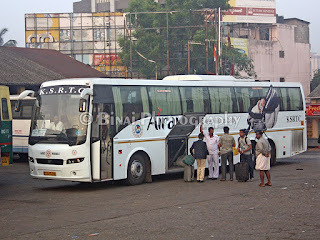 This time, I decided to try the Airavat Club Class to Thrissur. It took time to finalize, and finally booked the ticket online. I selected my new favorite seat, #16. The bus was mostly empty at the time I booked the ticket (the day prior to my journey). April 02, 2012: The evening of journey. For the first time, I did not ever remember to get a print-out of the ticket. I left from home at around 2000hrs for a 2110 departure (pretty late). My brother dropped me outside the bus station at around 2050hrs – my bus was standing there all set to move. I showed my m-ticket to the conductor, left the baggage in the boot and got into the bus. My co-passenger was already there. The load was looking impressive – not less than 40 seats, on a Monday from Bangalore! Just as the clock ticket 2110, the crew at the bus station remembered that they had parcels to load! Loading the parcels too some time, and we finally got moving at 2128hrs, an 18 minute delay at the origin! My bus: KA-01-F-9346. At Thrissur. The bus took the usual, Lalbagh route to get to Hosur road. We had another pick-up at Dairy circle (2138hrs). There was no pick-up at St. Johns, and hence the bus took the road via Ayyappa temple instead. There was heavy traffic block after Silk Board flyover – but our bus driver took the service road, and we managed to get past the snarl quickly. We stopped at Electronic City (2204) for pick up. The pick-ups were quick – we did not lose much time here. The driver picked up speed after Electronic City and we made quick progress. There was no traffic block at Hosur, thankfully. The bus went below the flyover at Hosur. We had yet another pickup – at Hosur (2231)! While we waited for the passenger, Kerala SRTC’s Bangalore-Palakkad Super Deluxe overtook us. I slept through the journey, and woke up around 0400hrs. I was expecting my bus to be past Coimbatore now. Had a hard time figuring out where we were. I was literally shocked – we were just reaching Coimbatore! We reached Coimbatore bus station at 0412! It took us 6 hours and 44 minutes! Not really bad considering the break we took, but still this was on the higher side. And, guess what – the Palakkad super deluxe which overtook us at Hosur was already standing at Coimbatore! Aaw! There was enough salt on the injury now. We left Coimbatore at 0414hrs. I slept off again. Thankfully our bus did not stop again for break (at the bakery near Ettimadai). We rushed through, and reached Palakkad at 0520. Quite a lot of passengers got off here. They did take in some new passengers from Palakkad as well. The ride after Palakkad was nothing great to write about – the usual bad road, heavy traffic run. The roads seemed to have worsened from my past ride – there was a lot of body roll. We stopped at Mannuthy to drop a passenger, and continued into the town. We stopped near Sakthan stand (private bus station) to drop another passenger. I got off my seat now, and headed towards the front to have a look at how the bus manages its way to the KSRTC bus station. Just as we reached the KSRTC bus station, the 2120 Ernakulam Mercedes came out of the bus station (wonder where did this guy overtake us – most probably when we went into Palakkad town). The bus finally dropped me at Thrissur KSRTC Bus station, dot at 0645 (late by exactly an hour). The 483 km journey took 9 hours and 17 minutes. That was too long, by all estimates! That was the longest in my history (or may be the second longest) of trips between Bangalore and Thrissur. The cake for the longest would also be held by KaSRTC, for sure. 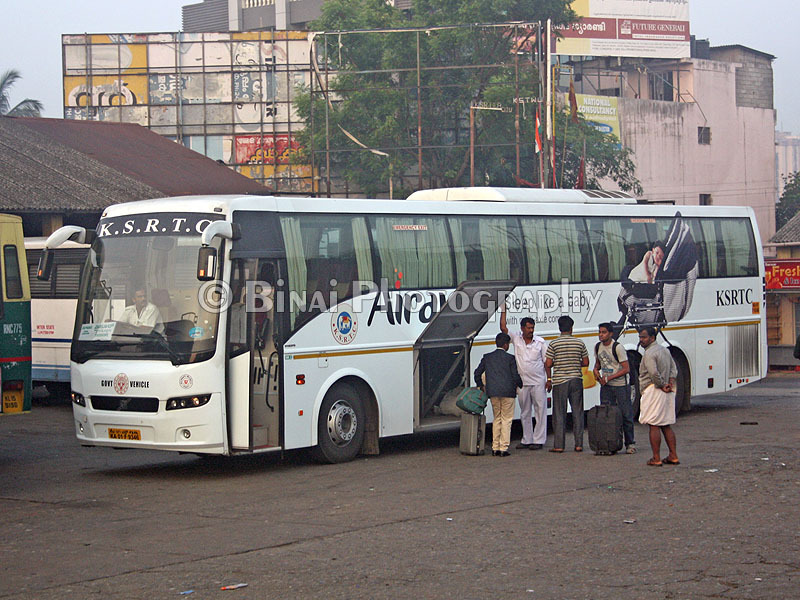 The quickest was undoubtedly by our own Kerala SRTC Garuda. The bus, KA-01-F-9346, was less than a year old – and had about 40K kms on the odo. This driver did lug the engine a lot – I was awake for most part of the Palakkad-Thrissur run, and it was evident that he was having the engine cry out on the highest gear most of the time. The new obsession that KaSRTC has on mileage is making their drivers torture the engines, and in turn making the bus reach its destination well behind schedule. After unwanted breaks, the next thing to drive off passengers is the obsession on mileage – absolute insensitivity to punctuality is not a great idea! Punctuality is a deleted word for KaSRTC. I had travelled in all schedules to EKM. They always start 15-30 min late and ends up with delays of more than one hour(once 3hr delay for EKM Corona). Little better one is BNG-EKM Volvo(10hrs). More worse in case of TVM Volvo which is usually overtaken by Garuda. Merc usually takes 11hrs. A few months back I took the club class from Borivli to Bangalore which was over 3 hours late. It was because the team driving the bus were the ones who drive to TVM. And the local guide, an agent from Borivli used it to try and pick up passengers and make a few rupees for his boss. As for mileage, the team was in for some serious trouble or so I gathered from their conversation because of the delay and the fuel they burnt in the process while getting from Borivli to Vashi where all the delay happened. And at Pune, getting to Swargate. KSRTC should seriously consider not going to Swargate bus station in Pune because though it makes the Punekars happy, it's not a good thing for Mumbai passengers. Nice review Binai,I always love reading your blog. I agree with Gopal KSRTC buses coming from mumbai should skip swargate as they can save upto an hour. I have travelled many times to pune in KSRTC & they are super punctual in this route. I always first prefer KSRTC over private operators.